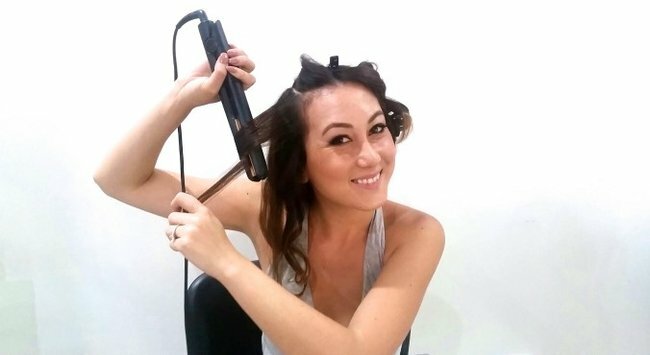 How to curl your hair with a ghd - it's foolproof. A foolproof guide to getting your curls perfect every time. Learning how to create the perfect ghd curl is like learning to ride a bicycle. Well, it kinda speaks for itself. Here are the steps to perfecting the notorious ghd curl. First of all, make sure your hair is completely dry and brushed through. Part your hair in the centre, or wherever you prefer – That part is up to you. Make sure your sections are of equal thickness. Your four secured sections should look something like this. You are looking at about 2-3 curls per section, depending on the thickness of your hair. If it is as fine as mine (I feel for you) it won’t take long at all. Just as an FYI, you should know that this post is sponsored by ghd. But all opinions expressed by the author are 100 per cent authentic and written in their own words. The two or three curls from each section should be divided from bottom to top, rather than side to side. This will add more volume and dimension to the hair. Something I seriously need. Now, here’s the tricky part. Place the ghd over your first section. Then, clamp the ghd from where you would like your curl to start. Clamp down, then turn it back on itself. Make sure you keep the iron at that same angle and slowly and steadily move the ghd down the hair shaft. Once that’s done, twirl your hair following the shape of the curl you have just created, and secure with a bobby pin. Here’s one I created earlier. This will help to set the curl while your hair is cooling down. Continue to make your way around your head, curling then securing with bobby pins as you go. Once you get the knack of it, it’s easy. See? I’m stoked. It’s all in the wrist. Remember, all you are doing is clamping the ghd down, and then turning it in on itself – Just like you would if you were revving a motorcycle – then, you slowly move the straightener down the hair shaft. Once you’re done, let your hair set for 5 minutes, then remove all your bobby pins. Voila, there you have it. Curls with a hair-straightener. If you want beachy tousled curls, comb through your hair with your fingertips. If a glamorous Hollywood wave is more to your taste, spritz with hairspray, then brush through your curls with a large paddle brush. Because volume and curls are so much better than flat, nothing hair. How do you get the best curls for your hair?